PHILIPSBURG, WILLEMSTAD - Francesco Corallo’s legal team in St. Maarten reacted to Curaçao’s Prosecutor’s Office stating on Thursday last week that the prosecutor expects a stiff jail sentence for the businessman when he stands trial in Italy in November. His legal defence team represented by Lawyer Jairo Bloem said on Sunday that while awaiting a decision on Italy’s extradition request, Francesco had been held in detention in the police cells in Philipsburg for 246 days. “On the day of his actual extradition, he was escorted by heavily armed members of the St. Maarten Arrest Team, blindfolded, ankle- and handcuffed and delivered as such to the Italian authorities. This, whilst the local authorities knew very well that the Italian Court had by then already revoked the Italian detention order for Francesco. “The European Court of Human Rights is expected to render a judgement shortly on the (il)legality of this detention and treatment of Francesco. Upon his arrival in Italy, Francesco was immediately released by the Italian authorities. He went home from the airport in a taxi, with the only obligation to report daily to a nearby police station within a fixed time-period of the day,” stated Bloem. He said Corallo had not been incarcerated or placed under house arrest in Italy. 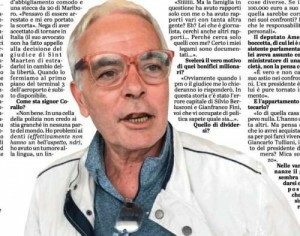 The daily-reporting obligation was terminated in February, his passport returned and there are absolutely no restrictions on Francesco’s freedom, according to Bloem. “Francesco was extradited to Italy to be prosecuted for suspicion of Involvement in a criminal association to embezzle taxes, fraudulently endanger the recovery possibilities for tax debts. Preliminary hearings were recently conducted and the case was sent to trial. The first main hearing is scheduled for November 30, 2018, in Italy,” added the lawyer. According to Bloem, the presiding justice of the preliminary hearings stated by verdict dated July 16, 2018, that although the prosecution had presented more than 500,000 pages in documents, it still has a long way to go to explain, show and prove why the described activities were illegal. “Francesco maintains his innocence and the joint legal defence team confirms that all taxes and payments due to the Italian state have been paid, in conformity with the Italian legislation. The accusations levied against Francesco lack both factual and judicial merit and we are therefore confident that Francesco will be fully acquitted,” concluded Bloem. Curaçao’s Prosecutor’s Office said on Thursday that the prosecution, during the handling of its financial claim case against former Prime Minister Gerrit Schotte and his life partner Cicely van der Dijs had considered bringing charges against Corallo.